NYC, 04/30/2019, 7:00PM. Stargazing in the City. Take a romantic walk along the park and a chance to take a closer look at the stars. 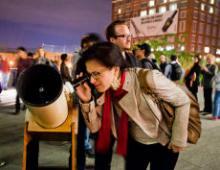 Peer through high-powered telescopes provided by the knowledgeable members of the Amateur Astronomers Association of New York to see rare celestial sights.